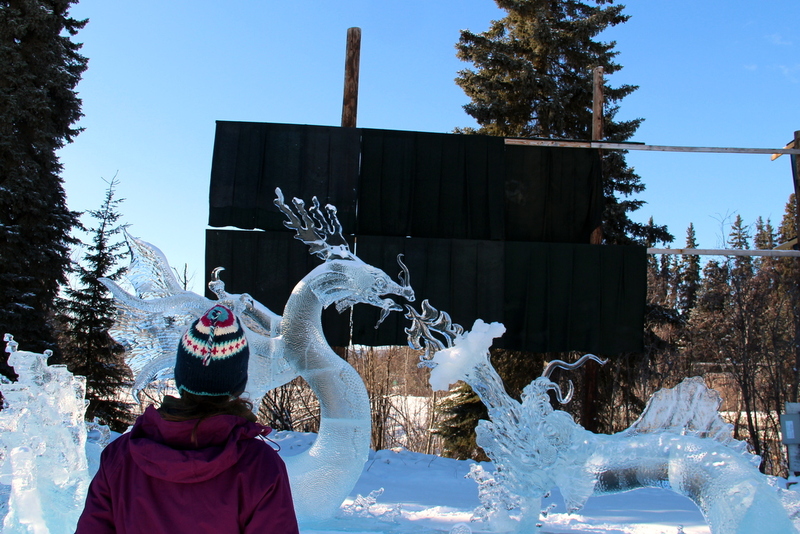 The main goal of our weekend trip to Fairbanks, Alaska, was to see the northern lights, and we definitely succeeded 🙂 Luckily for us, this remote town has much more to offer in March: The peak month for auroras coincides with the spectacular World Ice Art Championship… perfect timing! But before all the fun, we would have to earn it. We landed in Fairbanks in the middle of Friday night and found that our luggage had been lost somewhere between LA and Seattle. Still wearing jeans and light shoes, we got the first taste of Alaska cold arghghgh breathing outdoors was painful and our rental car was frozen. We decided to go to sleep and go shopping at REI the next morning, since we could return anything we’d buy. We ended up getting a call from the airport very early, as we were waiting in line with a shopping cart full of ski clothes… which we abandoned right there – sorry! 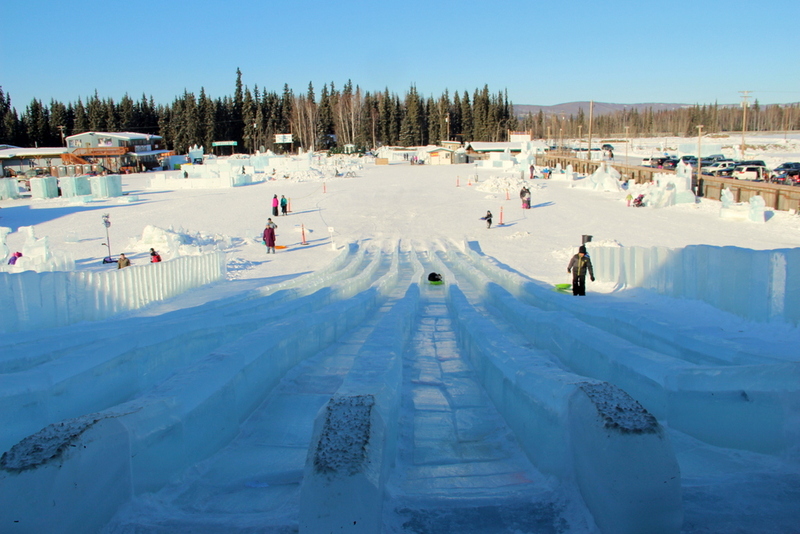 Once we were wrapped on every single piece of winter clothing we own, we headed to the Ice Park, where the World Ice Art Championship is hosted. 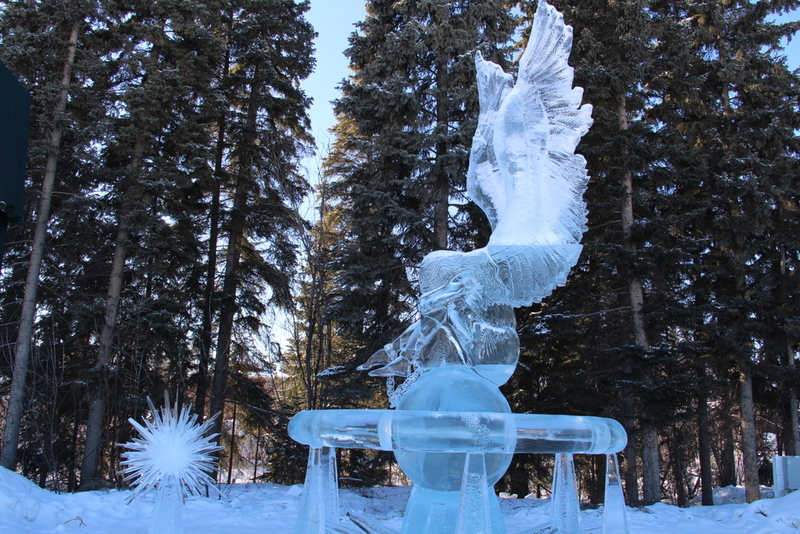 This mind-blowing ice sculpting contest takes place in Fairbanks every March, and artists from all over the world come to compete in the Multi-Block Classic and Single-Block Classic. 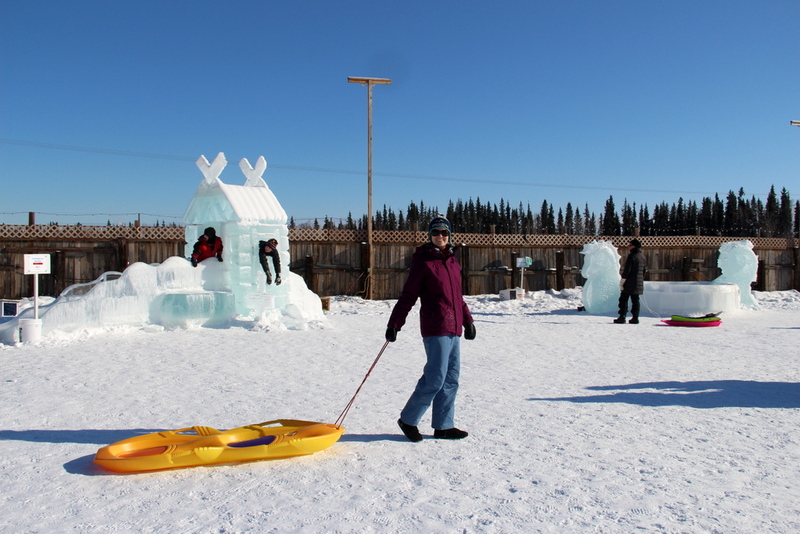 When we arrived, we found out that the event is much more than a competition, it’s a lively festival with dozens of sculptures plus a kids park with ice slides and bunch of other ice attractions (castles, trains, a maze, igloos, an ice rink, etc.). We saw that most people had sleds and asked if they were for rent; no, people just owned them… but if we found any abandoned ones, we could just take them, people leave them behind for others to use. Scored, we got an awesome double sled! 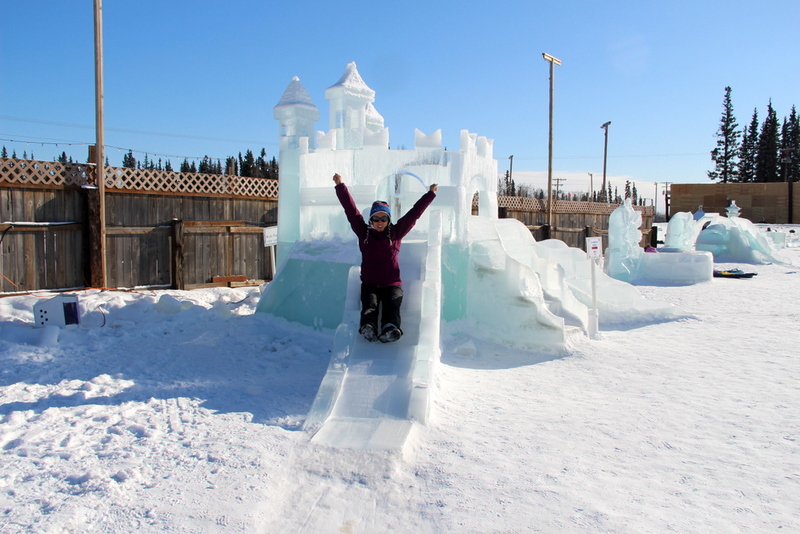 We played like kids in the castles and ran the ice slide a few times, it was so much fun. Then we walked around the multi-block sculptures. The creativity and precision were unbelievable. 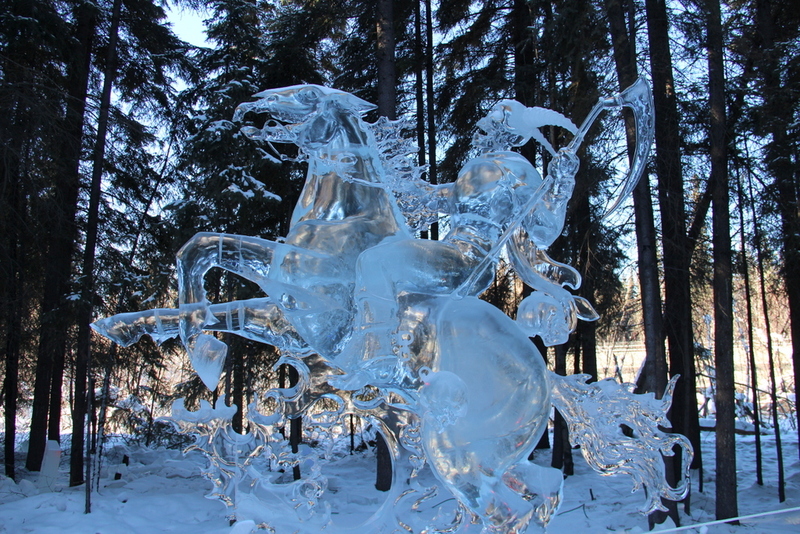 There was a Star Wars one, a King Kong, some fairies and dragons, houses, abstract scenes,… The ice blocks, which get pulled from a nearby pond, were so clear that they didn’t seem real. And somehow, the artists were able to carve super detailed shapes and give different textures. 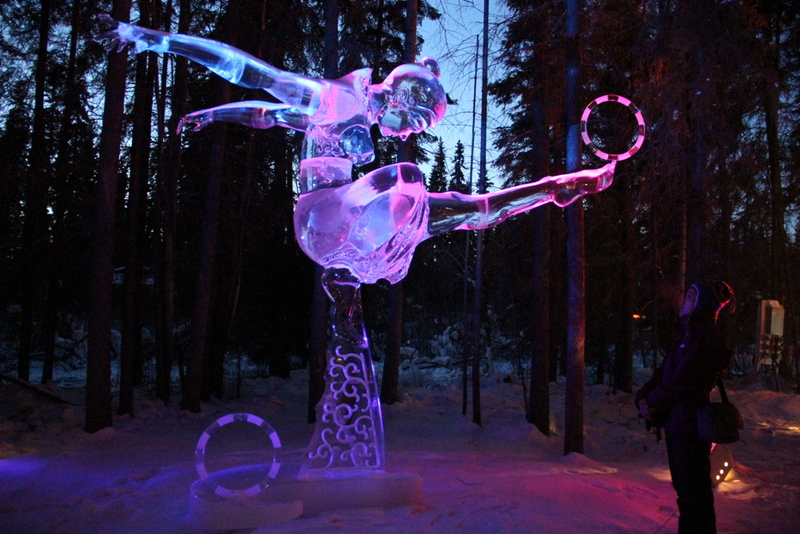 We walked back to the central area of the park to play with some of the sculptures from the amateur, un-judged Open. And then we made our way into the forest, where the single-block sculptures were protected from the sun. These were even better than the multi-block ones, if possible. They were delicate sculptures, like a ballerina, intricate ones, like a reaper, and even funny ones, like the mars rover. 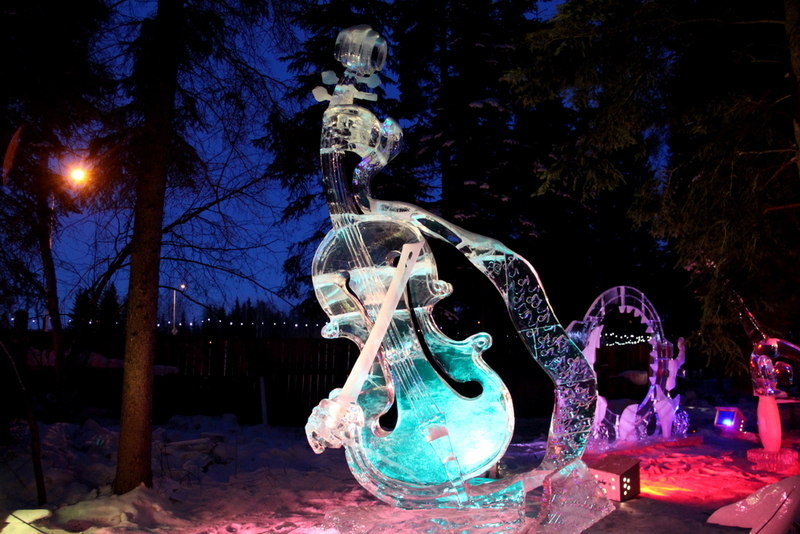 We loved our time at the Ice Park… and couldn’t wait to come back at night. 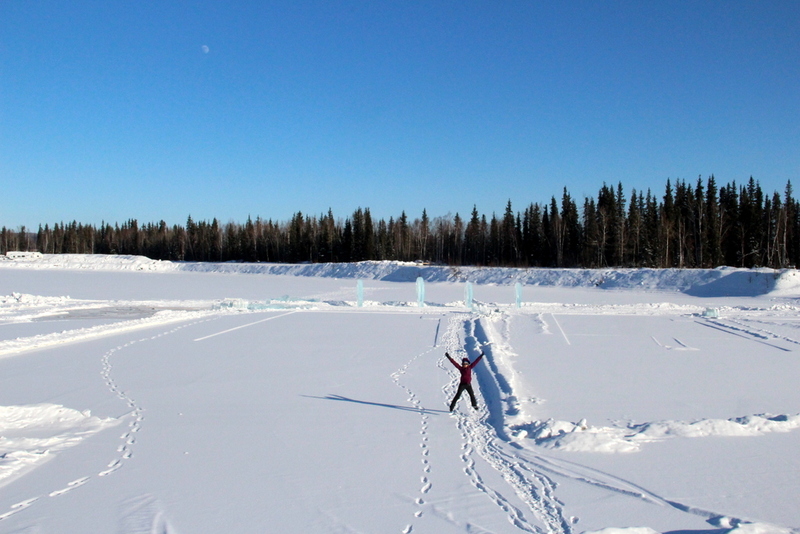 Before that, we had the genius idea of walking over to the pond from which they take the ice blocks. It was covered in untouched powder and absolutely beautiful. We made snow angels, threw some snowballs, and behaved as if we were 10 once again. After a much deserved meal and nap, we came back to the park right before 7pm, the last time they let people in, and when the sun starts setting. We patiently waited in the cafe, and man, we were in for a treat. 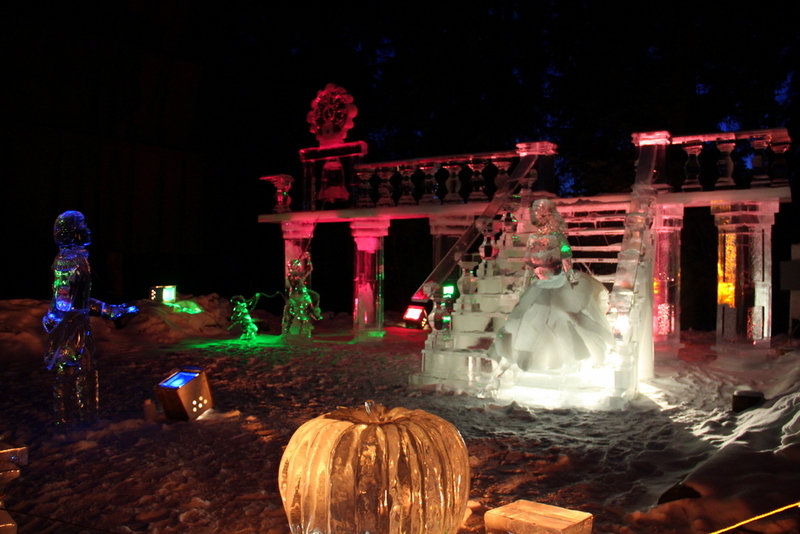 We wandered around the same ice sculptures we had seen earlier that day, now highlighted by colorful lights. 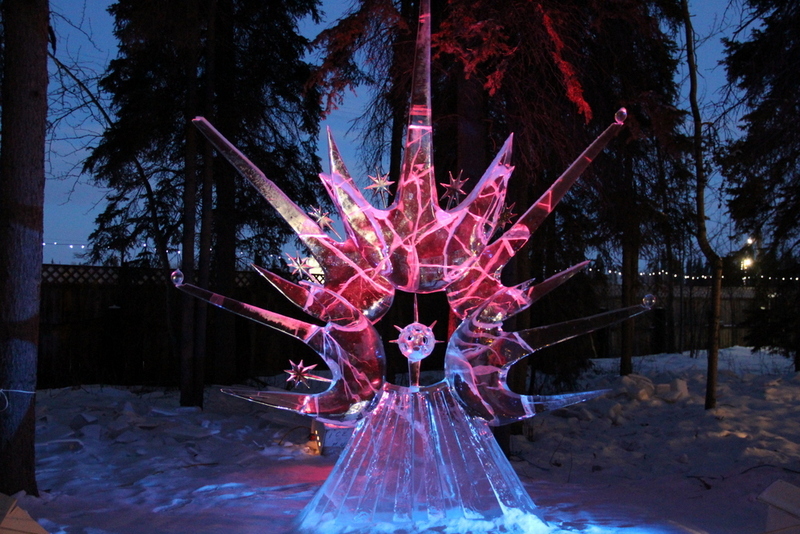 The whole setting was really cool: the shimmering snow, the dark trees, and the way the ice was illuminated, making all the details pop up and the piece stand out against the surroundings. It was magic, one of the best walks ever. And the night was not even over; a few hours later, we would witness the most amazing natural phenomenon, the northern lights. 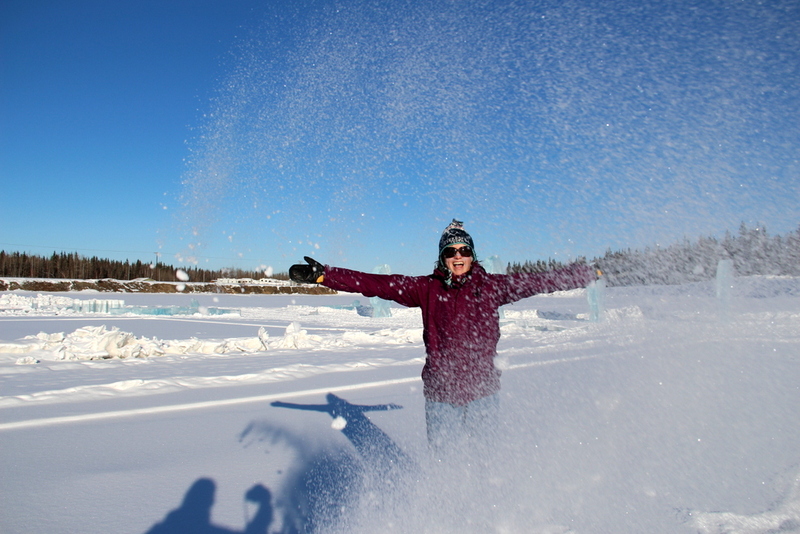 And our three day trip to Alaska had a few more surprises to offer the following day, when we would aim to snowshoe in wild Denali (post coming soon).